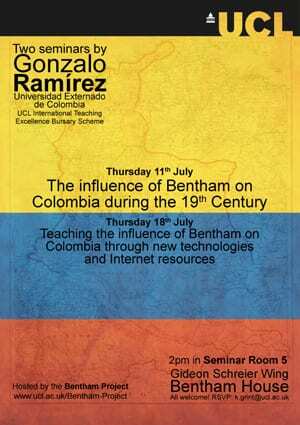 In July 2013 we welcomed Professor Gonzalo Ramírez from the Universidad Externado de Colombia to the Bentham Project as part of UCL’s International Teaching Excellence Bursary Scheme. In the course of his stay, Professor Ramírez delivered two fascinating seminars on the subject of Jeremy Bentham and the influence of his philosophy on Colombia. Professor Ramírez’s first seminar attracted scholars from a wide range of disciplines, from legal philosophers and historians to to those with interests in South American studies. 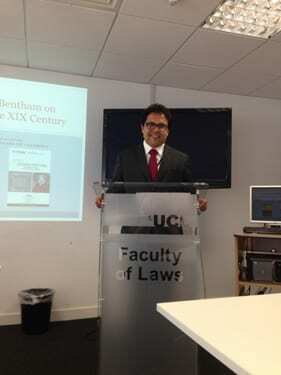 Commencing with an overview of the constitutional history of nineteenth-century Colombia, Professor Ramírez went on to trace the specific influence of Bentham’s thought on this topic. Although Bentham himself never visited Latin America, his philosophy was diffused via the Spanish translation of Dumont’s Traités (published in 1821) and through his extensive correspondence with important Latin American political figures, such as General Francisco de Miranda, Simón Bolívar and Francisco de Paula Santander. The seminar also included a survey of scholarly work which has hitherto focused on Bentham and Colombia, and several hints at where future research should be directed. We are excited to see where this line of study will take Professor Ramírez in the hopefully not-too-distant future! In the second seminar, focus switched from the historical to the pedagogical, with Professor Ramírez discussing the novel teaching methods he has employed whilst teaching a course on Bentham at the Universidad Externado de Colombia. Highlighting the use of blogs, social media and podcasts, Professor Ramírez offered valuable advice on how to adopt and utilize these new technologies for teaching purposes. Indeed, perhaps the most impressive feature of the Colombian Bentham course is the weekly podcast produced by the students, which both builds upon the ideas discussed in the seminars and allows distant learners to develop a taste for Bentham scholarship. The seminar also featured a video of Professor Philip Schofield’s (Director of the Bentham Project) recent Skype appearance at the Universidad Externado de Colombia – another example of the innovative use of new technology in academic teaching. The Bentham Project wishes to thank Professor Ramírez for his excellent contributions whilst at UCL and Ciarán Moynihan and Lorraine Dardis at UCL’s Office for International Affairs for their assistance in organizing the visit.